“Social cohesion is defined as the willingness of members of a society to cooperate with each other in order to survive and prosper. Willingness to cooperate means they freely choose to form partnerships and have a reasonable chance of realizing goals, because others are willing to cooperate and share the fruits of their endeavours equitably. Social cohesion contributes to a wide variety of social outcomes such as health and economic prosperity” (Stanley 2003:5). Social cohesion is a positive value in societies today, and there is a HUGE scholarly literature on the topic. 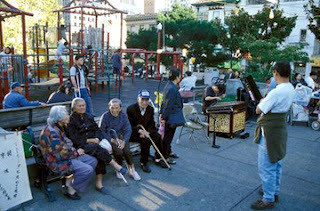 Klinenberg’s primary insight is to show how the built environment can promote social cohesion. 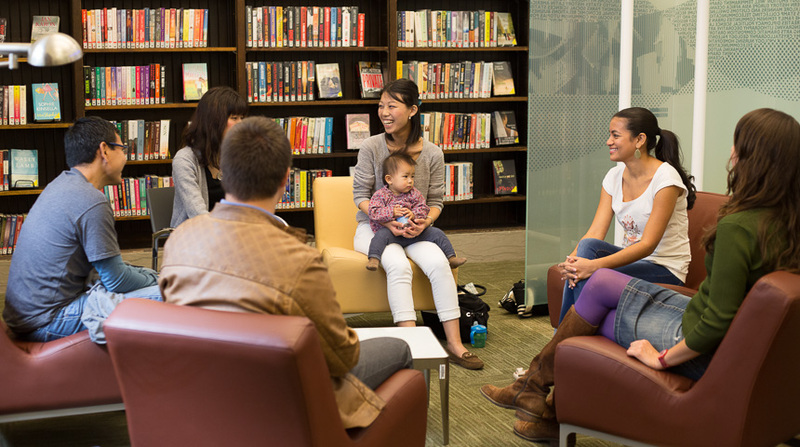 When people gather in places like libraries, parks, playgrounds, churches, or open markets, they interact with one another. These social interactions often occur with persons who may differ from one another in various ways. Social cohesion is a common outcome of these interactions. 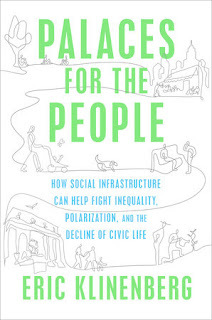 By building, protecting, and promoting such places, governments and authorities can promote the development of social cohesion, and “help fight inequality, polarization, and the decline of civic life” (to quote Klinenberg’s subtitle). but because their religion leads them to participate in common rituals and ceremonies. Anthropologist David Kertzer’s book, Ritual, Politics, and Power (Kertzer 1988) is an excellent study of this phenomenon, in both modern nations and the non-western small-scale societies studied by ethnographers. 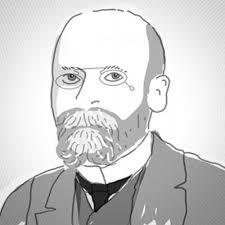 In Kertzer’s words, “Solidarity is produced by people acting together, not by people thinking together” (p. 76). Klinenberg puts it like this: “It’s long been understood that social cohesion develops through repeated human interaction and joint participation in shared projects, not merely from a principles commitment to abstract values and beliefs” (p.11). This leads into the second reason I particularly like Klinenberg’s approach—the importance of the built environment, and of the social and physical attributes of specific places that promote social cohesion. As an archaeologist, I study buildings and spaces where interactions once took place. Of course, the big problem for archaeology is that the physical remains—of a room, a building, or a formal open place—do not include the rules, norms, or practices of ancient patterns of behavior. Furthermore, archaeologists rarely encounter the furniture and other semi-fixed feature elements (Rapoport 1990) that are a crucial component of any setting for activities. 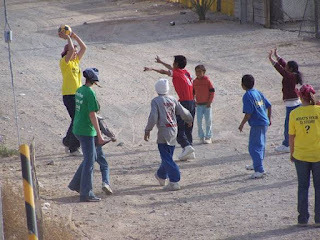 In a few cases, however, social cohesion and its physical context can be recovered archaeologically. I am thinking of well-understood historically-recent contexts where the archaeology is supplemented by written records. 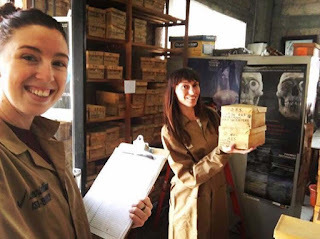 My student April Kamp-Whittaker is writing her dissertation on social cohesion, neighborhoods, and social dynamics at Amache, a World-War-II Japanese internment camp, and I am envious of the level of detail—both archaeological and documentary—she has to work with. Her research will make a contribution to our understanding of social cohesion, both in specific difficult conditions (an internment camp), and as a general phenomenon. 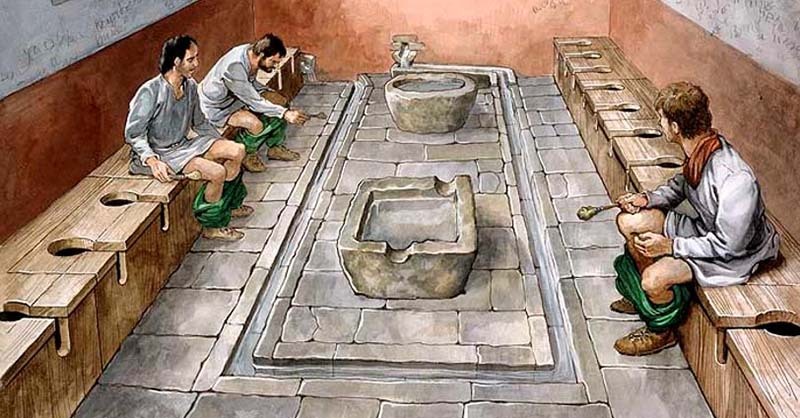 A less direct use of Palaces for the People for archaeologists is that it provides likely details and patterns for some of the contexts we study in ancient cities. For example, one might infer that premodern societies with more collective forms of governance had more, or larger, facilities of social infrastructure, compared to societies with more autocratic forms of rule. 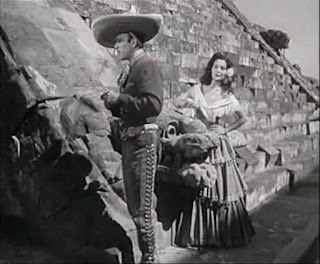 (See my post, "Ramses II vs. Pericles, or Darth Vader vs. the Rebel Alliance") This is something that is always on the minds of those of us who deal with ancient Teotihuacan. But, I’m not sure how far this can be pushed. In modern societies, civic life, social processes, and government are radically different from those of any ancient society. It requires some thought to figure out how well concepts like “social infrastructure” translate to early or nonwestern contexts. I am mulling these ideas over, and perhaps will blog about them in the near future. 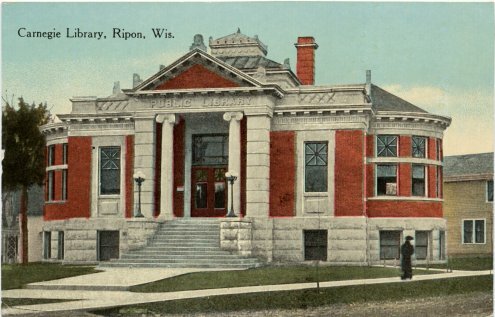 Palaces for the People is Andrew Carnegie’s term for public libraries in the U.S. Carnegie funded hundreds of libraries around the country, most of which are still active today. The book has a nice contrast between Carnegie's attitude and works and those of a modern equivalent figure, Marc Zuckerberg. 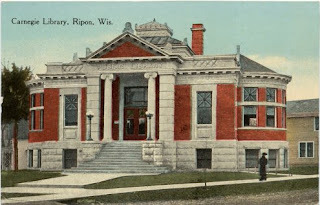 Klinenberg devotes a lot of space on libraries. While reading the book last week, I went to use a small branch library in rural Texas (to use the internet connection). The first thing I did was look for the public spaces, and yes, there was a big community room where local groups can meet. There is much more in this book that I don’t have space to go into. I highly recommend it. It will make you pay more attention to social infrastructure, and will help you appreciate its value and importance in society today. 2013 The Origins of Scaling in Cities. Science 340: 1438-1441. 2016 Population-Area Relationship in Medieval European Cities. PLOS-One 11 (10): e162678. http://journals.plos.org/plosone/article?id=10.1371/journal.pone.0162678. 1988 Ritual, Politics, and Power. Yale University Press, New Haven. 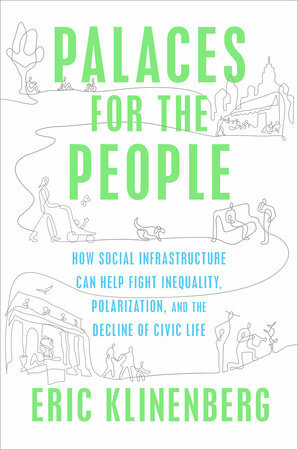 2018 Palaces for the People: How Social Infrastructure can Help Fight Inequality, Polarization, and the Decline of Civic Life. Crown, New York. 2017 Settlement Scaling in Middle-Range Societies. American Antiquity 82 (4): 662-682. 2016 Settlement Scaling and Economic Change in the Central Andes. 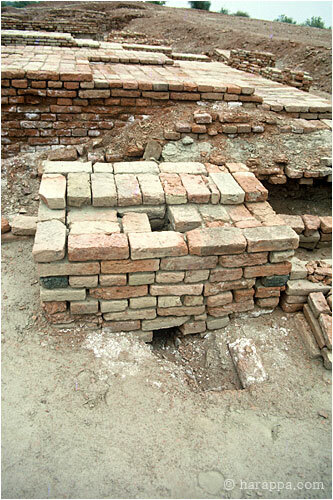 Journal of Archaeological Science 73: 94-106. http://bit.ly/2aHXpGk. 1990 Systems of Activities and Systems of Settings. In Domestic Architecture and the Use of Space: An Interdisciplinary Cross-Cultural Study, edited by Susan Kent, pp. 9-20. Cambridge University Press, New York. 2019 TheGenerative Role of Settlement Aggregation and Urbanization. In Coming Together:Comparative Approaches to Population Aggregation and Early Urbanization,edited by Attila Gyucha, pp. 37-58. State University of New York Press, Albany. 2003 What Do We Know about Social Cohesion: The Research Perspective of the Federal Government's Social Cohesion Research Network. The Canadian Journal of Sociology ' Cahiers canadiens de sociologie 28 (1): 5-17. Geophysical prospection work recently uncovered a tunnel/chamber deep underneath the Pyramid of the Moon at Teotihuacan. This is potentially exciting news; the most spectacular finds at Teotihuacan in the past decade are from another tunnel, excavated by Sergio Gomez under the Feathered Serpent Pyramid at the site. Indeed,t some of these objects are part of the current exhibit of Teotihuacan art, "Teotihuacan: City of Fire, City of Water" now at the Phoenix Art Museum. (1) Error in the title: This is not an “Aztec” pyramid, as claimed. It was built and abandoned long before the Aztec period. (2) Error in the first sentence: In contrast with the text, Teotihuacan was not an important center “during the Aztec empire.” It flourished a thousand years before the Aztec empire. (3) Misleading date in the second sentence: Technically, the claim that Teo monuments “predate the Aztec empire by at least 300 years is correct. With the same logic, you could claim that the Romans preceded the United States by at least 300 years. This is technically correct, but misleading. Teotihuacan flourished from AD 100 to 600. Aztec society dates to AD 1100-1521, and the Aztec empire dates to AD 1428 – 1519. (4) Error in second paragraph, the Moon pyramid does not “appear taller” than the Sun pyramid, as claimed. See photo. (5) Misleading statement, last paragraph: “The origin of the tunnel system - and the city – remains mysterious.” The term mysterious is frequently taken by the public to mean that some feature is too advanced or complicated for mere mortals to have devised, and thus one must invoke aliens. It is a common term on “Ancient Aliens” and pseudo-scientific internet sites that claim ancient cities were built by aliens. Archaeologists have data on the origins of the city, and this particular tunnel has not been sufficiently studied to reconstruct its chronology. There is nothing mysterious about the city or the tunnel. (6) Error, last paragraph: “Archaeologists attributed the foundation of Teotihuacan to various Mesoamerican cultures, like the Toltec, Zapotec, Mixtec, and even Maya.” I know of no archaeologist who has ever claimed any of these cultures as the founders or source of Teotihuacan. Prior to 1941, some archaeologists speculated that Teotihuacan was a Toltec site (that is, built by the historical Toltecs). But after 1941, it was recognized that The Toltec capital was Tula, not Teotihuacan, and that Tula rose to prominence 400 years after the fall of Teotihuacan. The other suggestions are ridiculous. (7) Misleading statement, last sentence: “Then the Aztec took over the abandoned ruins.” The Aztecs were aware of the ruins, and they even built some towns on the site of the ancient city. But they did not “take over” the ruins, in the sense of establishing an official presence, or regulating the ruins, or claiming them as belonging to the Aztec state or empire. (8) Error, last sentence: the Aztecs “rebuilt the old temples and expanded the preexisting tunnel-system.” The Aztecs did not rebuild the temples of Teotihuacan. As for the tunnels, we don’t know yet whether the Aztecs used or modified them. 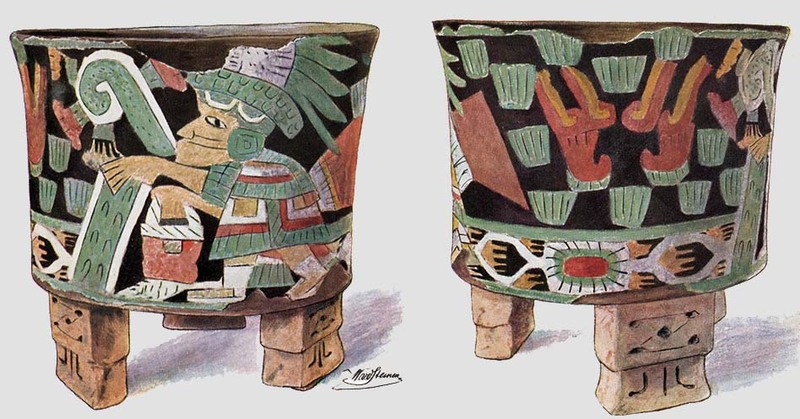 This post consists of an outline of themes and topics that relate to the art of Teotihuacan. It is focused on the objects in the exhibit, Teotihuacan: City of Water, City of Fire, currently at the Phoenix Art Museum. This is not a guide to the exhibit. Instead, I describe some of the main themes, gods, contexts, media, and rituals, all found in the objects at the exhibit. 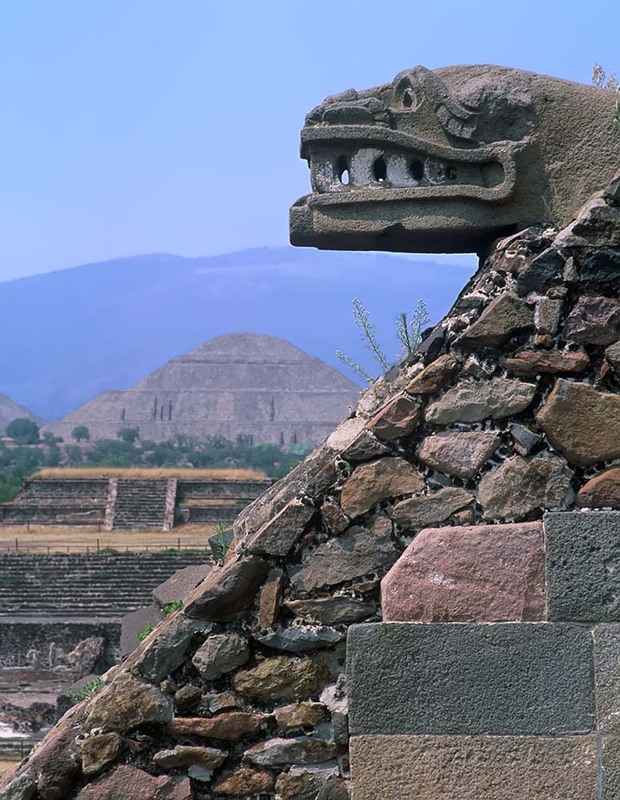 For more information about Teotihuacan, see an earlier post on this blog, "Resources on Teotihuacan." 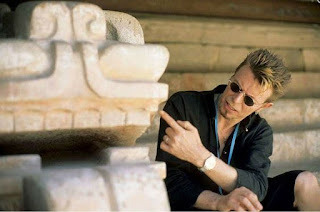 I am an archaeologist, not an art historian, and I am a relative newcomer to Teotihuacan research. If you find errors or problems in the list, or if you have suggestions or reactions, please feel free to email me. 1. Storm god (goggle eyes, fangs and curled upper lip, holding lightning bolts), Rain, storms, fertility; also, military might and battle. 2. Old fire god (sculptures, an old man sitting cross-legged with a receptacle for a hat). 3. Feathered serpent (pretty obvious). For more information, see my prior post. 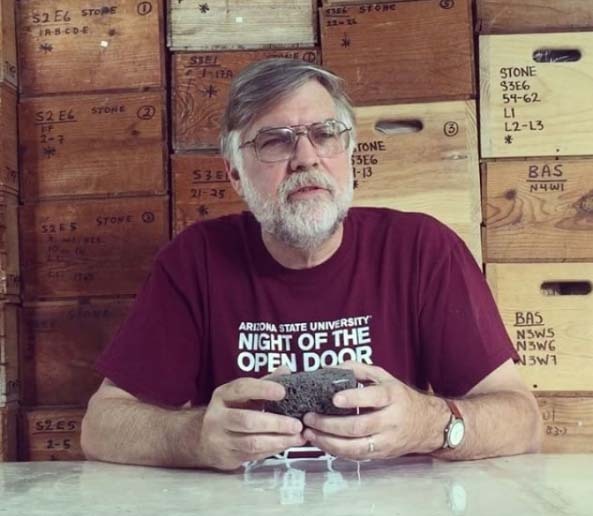 Or check out the Twitter feed of the ASU lab at Teotihuacan: https://twitter.com/asuteolab, or mine: https://twitter.com/MichaelESmith. Two factors conspire right now to emphasize to me the importance of ancient Maya urban demography. First, I finished reading David Webster’s new book, The Population of Tikal (Webster 2018). Second, today I returned from a Working Group of the Social Reactors Project at the Santa Fe Institute , where our focus was on Maya cities and settlements. Needless to say, we talked a lot about population. One of the most important things one can know about a city or settlement is its size. How many people lived there? Over what area? (and, consequently, What was the density and how did it vary?) These are fundamental observations in many disciplines that study cities and settlements, from urban history to urban economics, to urban geography. In chapter 3 of my current book, Urban Life in the Distant Past, I make the case for the importance of knowing the sizes of cities in the past (Smith n.d.). 3. How can we explain the huge population drop with the Classic Maya collapse? But wait, how can you compare an urban density at Tikal to a regional density for other regions? Isn’t that a comparison of apples and oranges? 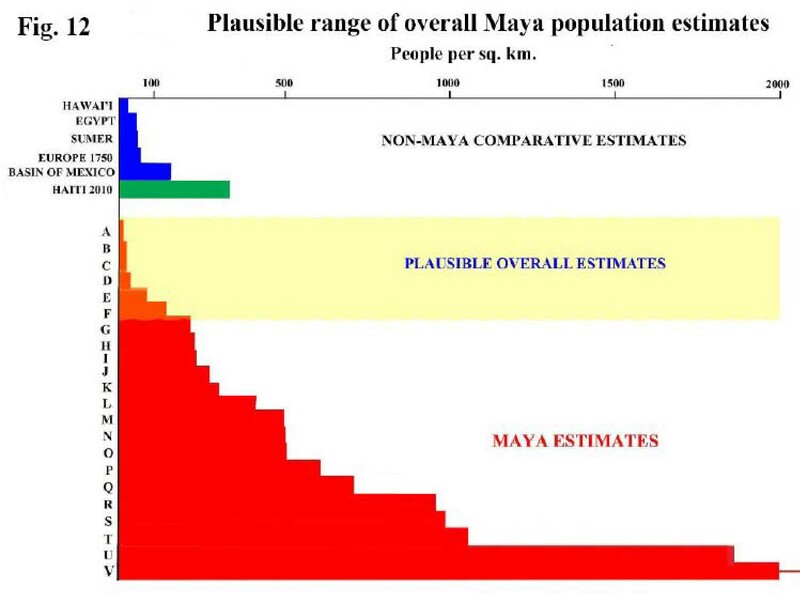 Those familiar with David Webster’s past work will get this right away: The Maya did not have cities, and therefore the concept of urban population density is moot! “I prefer not to call any part of this landscape a ‘city’.” (p. 35). OK, maybe instead of “urban” we should call inner Tikal, “The area close to the pyramids that had a higher density than the outlying areas.” But this would still cast doubt on many of Webster’s comparisons. Another problem I have with the new book is that much of the quantitative data are presented within the text, and not in tables. Yes, there are a few data tables with some pertinent information. 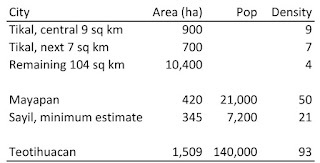 But I get confused, for example, when he gives a population estimate for Tikal of 10,000 (p. 52, paragraph 2), an area estimate of 452 square km (p.52, paragraph 7), and an overall density of “100-175 people per sq. km” (same paragraph). Huh? 10,000 people divided by 452 sq km is a density of 22.1 persons per sq km. One of these figures must be off. I must admit that this is a pet peeve: If you use quantitative data, put them in a table! I struggled throughout the book with this. Yes, there are a couple of tables with data. But where making detailed comparisons and analyses of population and density data throughout the book, the figures are only found in the text, not in tables. Putting quantitative data into the text but not in a table makes it difficult for readers to re-use or analyze the data. I’ll stop here, this is not a book review. The book is fun to read, like most of David Webster’s work, and I learned a lot. But the basic quantitative treatment, and the lack of a good conceptual framework for urbanism, or for regional settlement variation, limits the value of the book. Our working group on Maya settlement included my colleagues in the Social Reactors Project, plus Jerry Sabloff, Bernadette Cap, Adrian Chase, Julie Hoggarth, and Heather Richards-Rissetto. Sarah Klassen, who works on urban issues at Angkor, also participated. See a short description of the session here. Instead of giving a report of our workshop on Maya settlement, I’ll just mention a few key points. First, we have found data on several regional settlement systems where area scales with population in a superlinear fashion. That is, larger sites are LESS DENSE than smaller sites; This is the opposite of all other agricultural societies we have studied (see our papers here). So, Maya settlement differs from other agricultural societies in ways that remain hard to pin down. We have a paper in the works, and plans for more collaborations and research in the future. Second, some Maya settlements are very much like settlements in other areas, and some are very different. Not too surprising, I guess, but we discussed some of the patterns. Third, Angkor looks very different from the Maya cities. 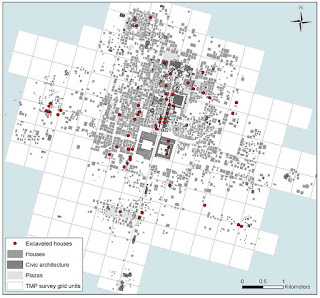 It had a very dense urban core, with planned orthogonal neighborhoods surrounding major temples, surrounded by a large sprawling area of temples, houses, and reservoirs, In comparison, Maya urban cores seem only slightly higher in density than their outer neighborhoods. I’m starting to wonder about the usefulness of Roland Fletcher’s (2009; 2012) concept of “low-density urbanism” as a category that includes the Classic Maya and Angkor. 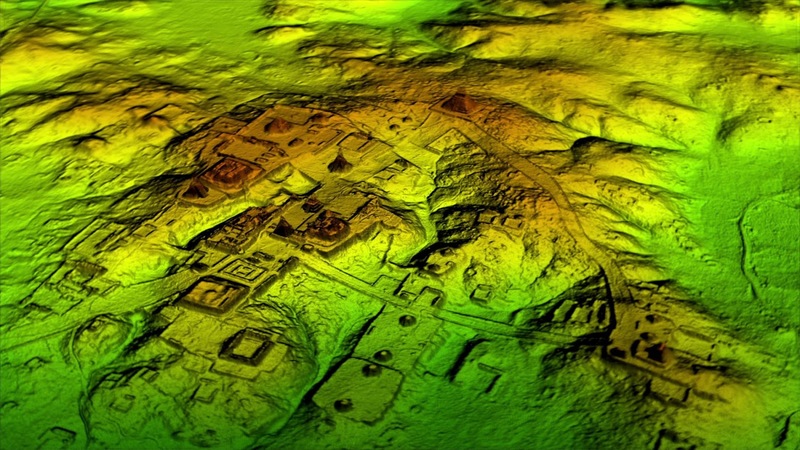 Fourth, we discussed the use of LiDAR for analyzing the sizes and layouts of Maya cities. 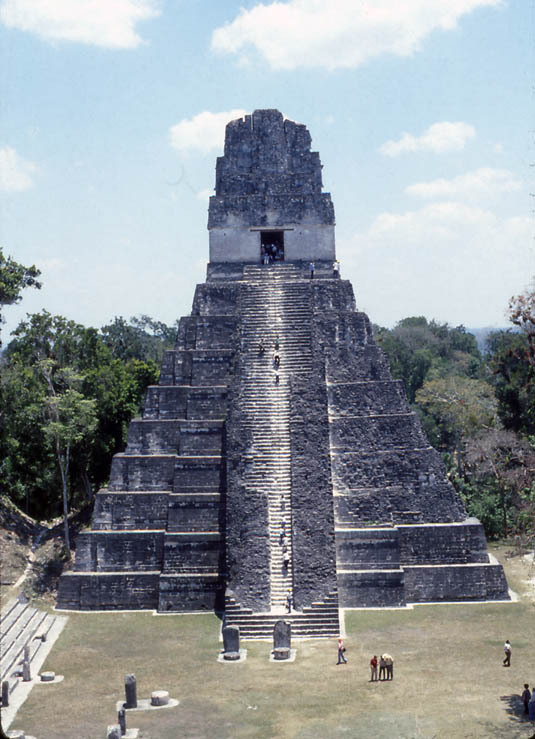 We spent some time comparing Tikal and Caracol. My view is that Caracol was a large, integrated urban center, while Tikal was a much smaller city of ca. 16 sq km. (I know the Chases will agree about Caracol, but I’m not sure of their views of Tikal). A key question – indeed, one of our targeted themes at the working group – is the nature of settlement boundaries. I don’t see any evidence for clear boundaries at Tikal. However, there does seem to be a drop-off in density beyond the central 16 sq km mapped by Carr and Hazard, which favors bounding the city there (see table). Whereas Caracol has various features that seem to signal a spatial and social integration over a large area (causeways, replicated patterns of civic architecture pointing to the integration of different areas, and a continuous stretch of agricultural terracing). Outside of the core area, Tikal lacks these things. All those areas beyond several km from downtown Tikal – these must have been rural areas, the hinterland of the city of Tikal. This is a provisional analysis. I want to analyze the density patterns objectively (kernel density analysis), to see whether there is indeed a zone of declining density (well, more precisely, I want a student to do this…). We should do such analyses for all of the Maya (and other!) sites that are well mapped. Intra-urban density distributions are a big unknown for ancient cities, but we now have the data and methods to work on this question. This table shows a bit of density data. I was having trouble finding the information, buried in Webster’s text, so I got the Maya figures from a nice table in a paper by Barbara Stark (Stark 2014). Note the drop of 50% in density beyond the central 16 sq km. Teotihuacan figures are from a paper now under review (Smith, et al. n.d.). 1. Regional density, 1: Large area. For a large zone including several urban centers. E.g., the southern Maya lowlands. Useful for large-scale comparisons (of the type Webster makes with other regions). 2. Regional density, 2: Urban hinterland. Density over the hinterland of a city. E.g., Copan Valley. Useful to compare settlement in, say, the Copan Valley with the Belize River Valley. 3. 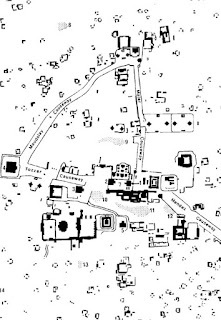 Urban density: whole city (all of Tikal or Caracol, or Teotihuacan). This is probably the most useful measure for urban comparisons. Of course, one must first identify the boundaries of the urban settlement….. We discussed this at SFI, and I am working on some methodological guidelines. 4. Epicenter density: The population density of residences clustered around the ceremonial core. Not sure if this should include the civic areas or not. I am less confident in this unit, compared to the others. 5. Neighborhood density: Density of a delimited neighborhood or zone. This is useful for several reasons: (1) To compare neighborhoods within a city; (2) To generate density data where whole-site information is not available. 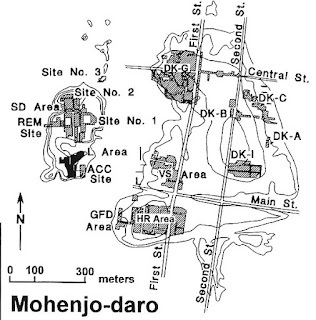 For example, consider Mohenjo-daro. Several neighborhoods have been completely excavated, but the residential patterns of the entire site are not clear. If you were looking for solid data or conclusions about Maya urban demography here, I am sorry to disappoint you. This field is in its infancy. Culbert and Rice (Culbert, and Rice 1990) was a crucial work, but there has been very little work since then. Webster’s new book is a step in the right direction, but we need many more such analyses (with lots of data in tables!). But I am more optimistic now than I’ve been for some time now. The session at SFI made some progress, and I see some good research coming out of these and other archaeologists in the near future. I am itching to work on settlement delineation at a variety of sites, using quantitative spatial methods. And, finally, I know that a number of prominent Mayanists agree that urban demography is important, and I look forward to more work in the near future. Campoli, Julie and Alex S. MacLean (2007) Visualizing Density. Lincoln Institute of Land Policy, Cambridge, MA. Culbert, T. Patrick and Don S. Rice (editors) (1990) Precolombian Population History in the Maya Lowlands. University of New Mexico Press, Albuquerque. Dovey, Kim and Elek Pafka (2014) The Urban Density Assemblage: Modelling Multiple Measures. Urban Design International 19:66-76. Fletcher, Roland (2009) Low-Density, Agrarian-Based Urbanism: A Comparative View. Insights (University of Durham) 2:article 4. Fletcher, Roland (2012) Low-Density, Agrarian-Based Urbanism: Scale, Power and Ecology. In The Comparative Archaeology of Complex Societies, edited by Michael E. Smith, pp. 285-320. Cambridge University Press, New York. Smith, Michael E. (n.d.) Urban Life in the Distant Past: Archaeology and Comparative Urbanism. (book in progress). 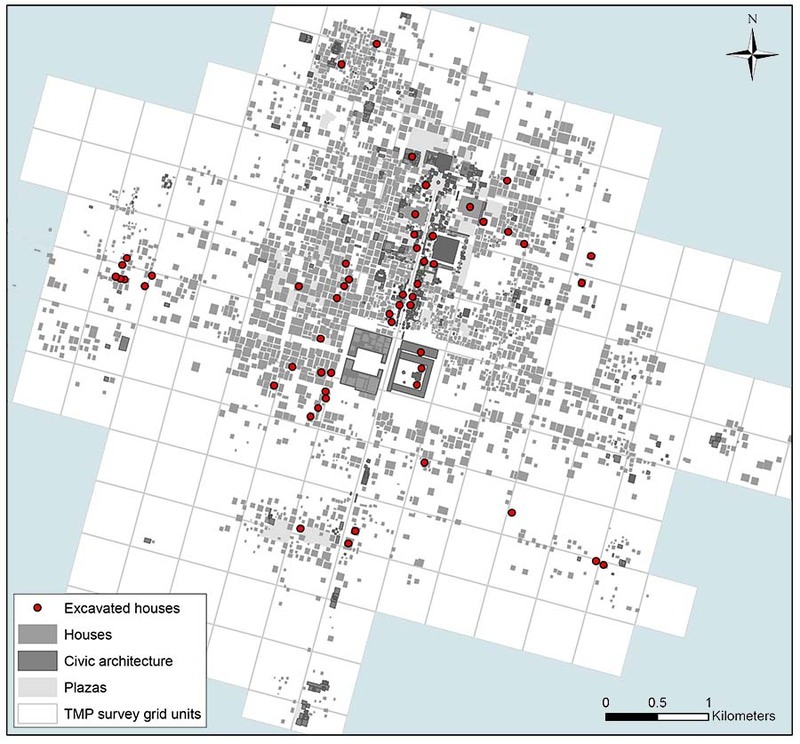 Smith, Michael E., Abhishek Chatterjee, Sierra Stewart, Angela Huster and Marion Forest (n.d.) Apartment compounds, households, and population at Teotihuacan (paper under review). Stark, Barbara L. (2014) Ancient Open Space, Gardens, and Parks: A Comparative Discussion of Mesoamerican Urbanism. In Making Ancient Cities: Space and Place in Early Urban Societies, edited by Kevin D. Fisher and Andy Creekmore, pp. 370-406. University Press of Colorado, Boulder. Webster, David (2018) The Population of Tikal: Implications for Maya Demography. Archaeopress, Oxford. Teotihuacan was one of the major cities of the ancient world, and the available materials on the internet are scattered around. The Wikipedia entry is not very good. I have not seen a good bibliography of works for someone who wants to know about research at the site as written by the relevant archaeologists or good journalists. I am going to use this blog post to create a bibliography and guide to materials on Teotihuacan. It may take me a while to get it all together, so please check back periodically. If you have suggestions, please send them to me. 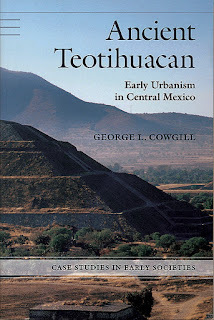 The Best Book on Teotihuacan !!! 2017 It wasn't just Greece: Archaeologists find early democraticsocieties in the Americas. Science2 55:1114-1118. 2015 Lessons from Teotihuacan. Bostonia (Fall 2015): 36-43. 2014 Beyond the Temples:Turning Their Backs onSpectacular Monuments, Archaeologists are StudyingOrdinary Households toUncover the Daily Rhythms of Long-Lost Cities. Science 344:684-686. 2014 Gods of Blood and Stone. Scientific American July:48-55. Check out our lab's website. In this photo, I am sitting in front of a wall of groundstone crates. It is an attractive backdrop, but I doubt our employee Oscar would agree (he is moving these crates around this week). Spanish version of the above (in HuffPost-Mexico), "Lacuriosa leccion de igualidad social que revela Teotihuacan"
*** I have taken the liberty of posting the more relevant papers by Millon and Cowgill. If there is not a link, and you want a copy, please contact the article's author directly. 2016 Teotihuacan. Journal of Archaeological Research 24 (1): 1-74. 1976 Social Relations in AncientTeotihuacan.In The Valley of Mexico: Studies of Pre-Hispanic Ecology andSociety,edited by Eric R. Wolf, pp. 205-248. University of New MexicoPress,Albuquerque. 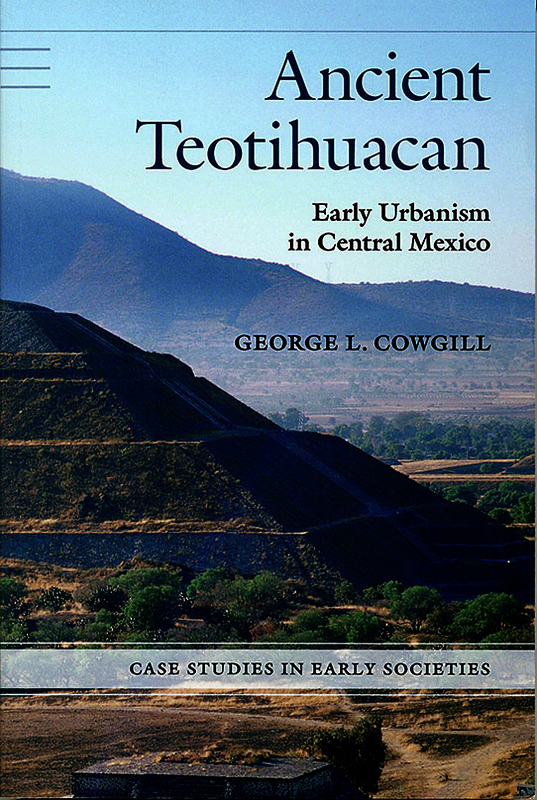 1981 Teotihuacan: City, State, and Civilization.In Archaeology,edited by Jeremy Sabloff, pp. 198-243. Supplement to theHandbook of MiddleAmerican Indians, vol. 1. University of Texas Press, Austin. 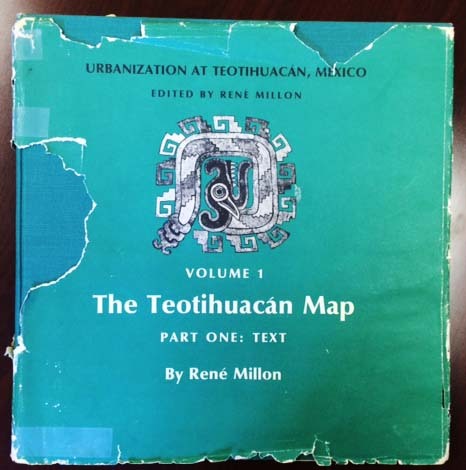 1992 Teotihuacan Studies: From 1950 to 1990 andBeyond. In Art,Ideology, and the City of Teotihuacan, edited byJanet C. Berlo, pp. 339-429.Dumbarton Oaks, Washington, DC. 1997 State and Society at Teotihuacan,Mexico. AnnualReview of Anthropology 26: 129-161. 2008 An Update on Teotihuacan. Antiquity82: 962-975. 2005 Observations on the Pecked Designs and other Figures Carved on the South Platform of the Pyramid of the Sun at Teotihuacan. Journal for the History of Astronomy 36 (1): 31-47. 2007 New Findings of Mural Painting. 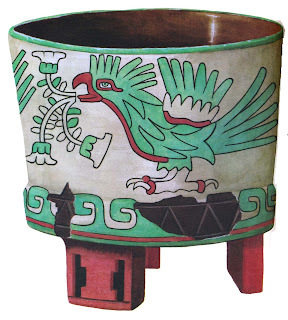 In Museo de murales Teotihuacanos Beatriz de la Fuente, edited by María Teresa Uriarte and Tatiana Falcón, pp. 229-239. Instituto de Investigaciones Estéticas, Universidad Nacional Autónoma de México, Mexico City. 2007 Implements of State Power: Weaponry and Martially Themes Obsidian Production near the Moon Pyramid, Teotihuacan. Ancient Mesoamerica 18 (1): 173-190. 2013 The Social Organization of Craft Production and Interregional Exchange at Teotihuacan. In Merchants, Markets, and Exchange in the Pre-Columbian World, edited by Kenneth G. Hirth and Joanne Pillsbury, pp. 113-140. Dumbarton Oaks, Washington, DC. 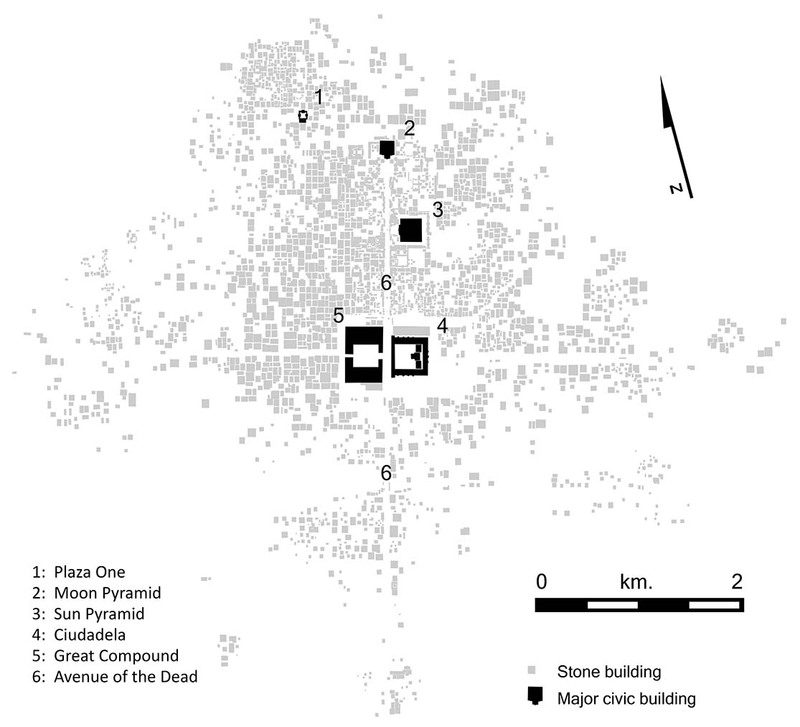 2015 Teotihuacan: An Early Urban Center in its Regional Context. In Early Cities in Comparative Perspective, 4000 BCE - 1200 CE, edited by Norman Yoffee, pp. 279-299. The Cambridge World History, volume 3. Cambridge University Press, New York. 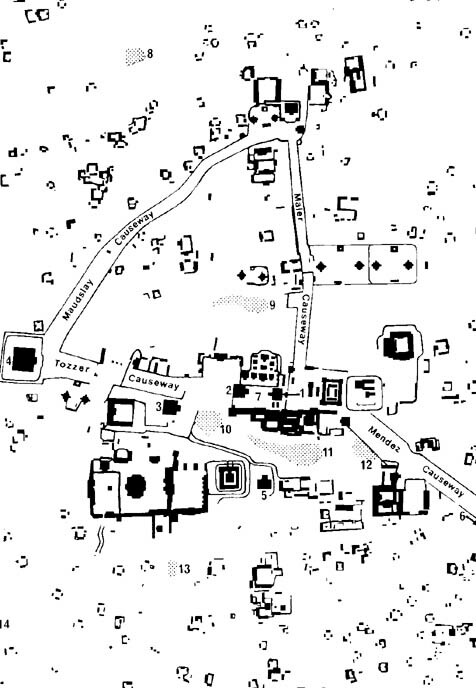 1984 Spatial Analysis of Teotihuacan, a Mesoamerican Metropolis. In Intrasite Spatial Analysis in Archaeology, edited by Harold J. Hietala, pp. 154-195. Cambridge University Press, New York. 2016 Location and Orientation of Teotihuacan, Mexico: Water Worshsip and Processional Space. In Processions in the Ancient Americas, edited by Susan T. Evans, pp. 52-121. Occasional Papers in Anthropology, vol. 33. Department of Anthropology, Pennsylvania State University, State College, PA.
2009 The House of New Fire at Teotihuacan and its Legacy in Mesoamerica. In The Art of Urbanism: How Mesoamerican Kingdoms Represented Themselves in Architecture and Imagery, edited by William L Fash, Jr. and Leonardo López Luján, pp. 201-229. Dumbarton Oaks, Washington, DC. 2009 Características arquitectónicas en algunas construcciones de fases tempranas en Teotihuacan. Arqueología 42: 216-233. 2013 The Exploraiton of the Tunnel under the Feathered Serpent Temple at Teotihuacan: First Results. In Constructing, Deconstructing, and Reconstructing Social Identity: 2,000 Years of Monumentality in Teotihuacan and Cholula, Mexico, edited by Saburo Sugiyama, Shigeru Kabata, Tomoko Taniguchi, and Etsuko Niwa, pp. 11-18. Aichi Prefectural University, Cultural Symbiosis Research Institute, Aichi. 2015 Un posible cancha de juego de pelota en el área de la Ciudadela, Teotihuacan. Anales de Antropología 49 (1): 113-133. 2013 The Writing on the Wall: A Paleographic Analysis of the Maya Texts of Tetitla, Teotihuacan. In The Maya in a Mesoamerican Context: Comparative Approaches to Maya Studies, edited by Jesper Nielsen and Christophe Helmke, pp. 123-166. Acta Mesoamericana, vol. 26. Verlag Anton Saurwein, Markt Schwaben. 2017 Life after Death in Teotihuacan: The Moon Plaza's Monolilthis in Colonial and Modern Mexico. In Visual Culture of the Ancient Americas: Contemporary Perspectives, edited by Andrew Finegold and Ellen Hoobler, pp. 59-90. University of Oklahoma Press, Norman. 1996 Corporate Groups and Domestic Activities at Teotihuacan. Latin American Antiquity 7: 228-246. 2004 Social Identity and Daily Life at Classic Teotihuacan. In Mesoamerican Archaeology: Theory and Practice, edited by Julia A. Hendon and Rosemary Joyce, pp. 124-147. Blackwell, Oxford. 2009 Corporate Life in Apartment and Barrio Compounds at Teotihuacan, Central Mexico: Craft Specialization, Hierarchy, and Ethnicity. In Domestic Life in Prehispanic Capitals: A Study of Specialization, Hierarchy, and Ethnicity, edited by Linda R. Manzanilla and Claude Chapdelaine, pp. 21-42. Memoirs, vol. 46. University of Michigan, Museum of Anthropology, Ann Arbor. 2001 Exploraciones en un posible palacio de Teotihuacan: El Proyecto Xalla (2000-2001). Mexicon 23: 58-61. 2012 Silent Hazards, Invisible Risks: Prehispanic Erosion in the Teotihuacan Valley, Central Mexico. In Surviving Sudden Environmental Change, edited by Jago Cooper and Payson Sheets, pp. 143-166. University Press of Colorado, Boulder. 2003 Paleosols in the Teotihuacan Valley, México: Evidence for Paleoenvironment and Human Impact. Revista Mexicana de Ciencias Geológicas 20: 270-282. 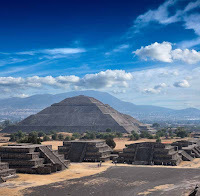 2015 Replicative construction experiments at Teotihuacan, Mexico: Assessing the duration and timing of monumental construction. Journal of Field Archaeology: published online first. 2015 Where Kings Once Ruled? 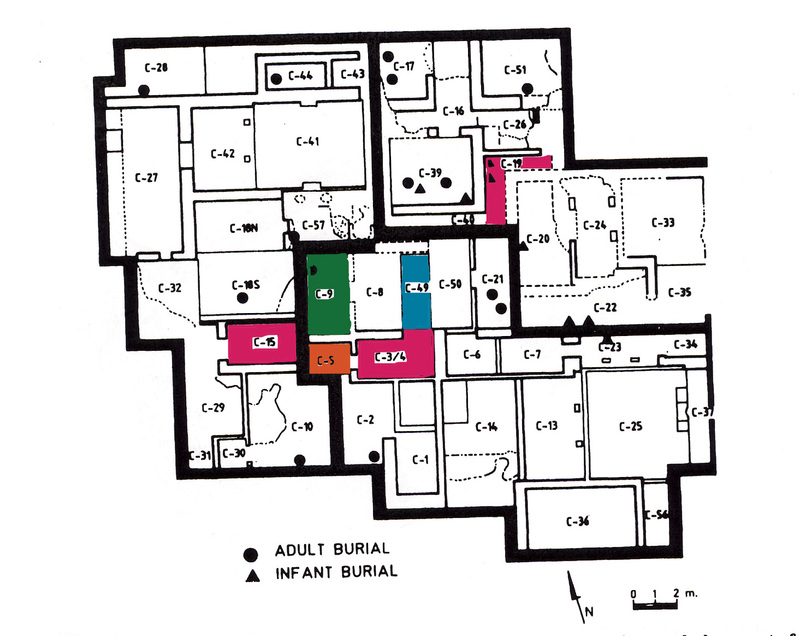 Consideration on Palaces and Rulership at Teotihuacan. In Palaces and Courtly Culture in Ancient Mesoamerica, edited by Julie Nehammer Knub, Christophe Helmke, and Jesper Nielsen, pp. 7-22. Archaeopress, Oxford. 2011 Reinterpreting the Plaza de los Glifos, La Ventilla, Teotihuacan. Ancient Mesoamerica 22 (2): 345-370. 2013 Los conjuntos habitacionales: Ejemplos de arquitectura urbana. 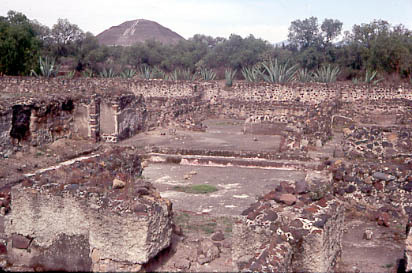 In Teotihuacán. Nueva mirada al pasado: Arqueología de Salvamento, edited by Verónica Ortega Cabrera and Aldo Díaz Avelar, pp. 38-55. Editorial Académica Española, Madrid. 2015 Investigating Teotihuacan through TMP Surface Collections and Observations. Ancient Mesoamerica 26 (1): 163-181. 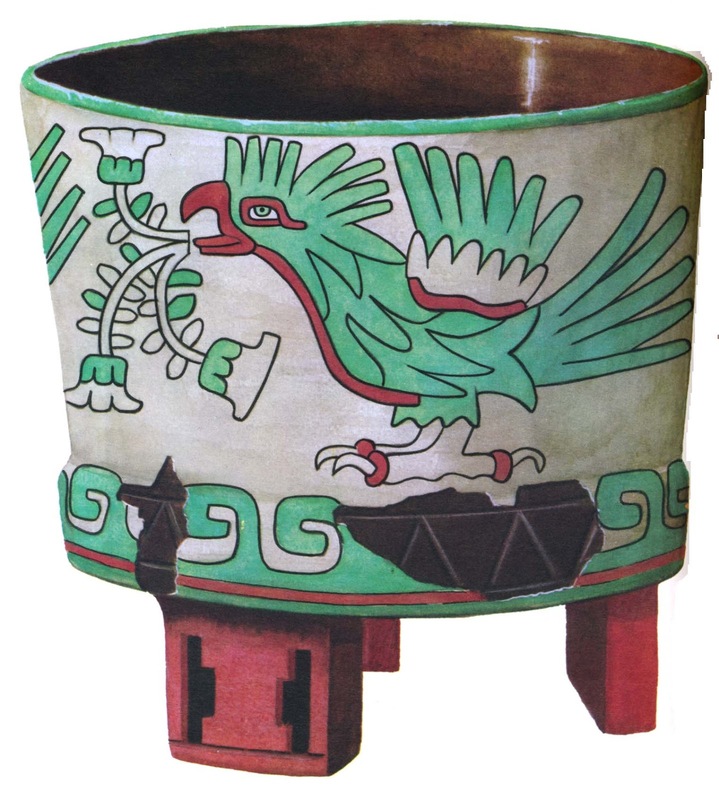 2016 Teotihuacan pottery as evidence for subsistence practices involving maguey sap. Archaeological and Anthropological Sciences 9 (1): 11-27. 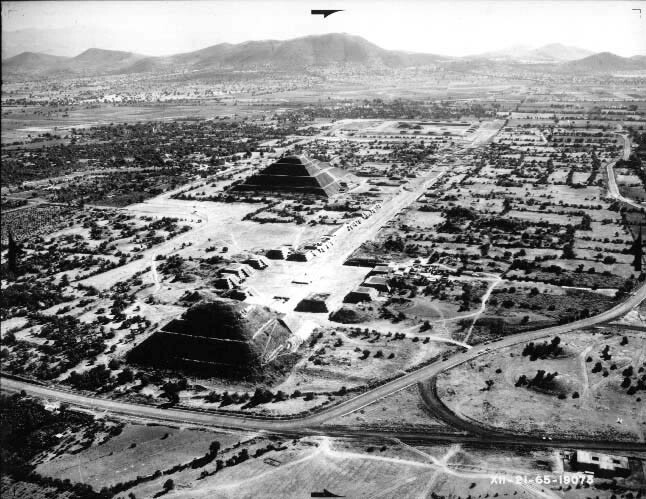 2017 TheTeotihuacan Anomaly: The Historical Trajectory of Urban Planning inCentral Mexico. OpenArchaeology 3(1): 175-193. 2015 Las almenas en la ciudad antigua de Teotihuacan. 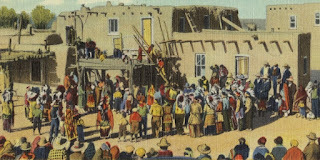 Mexicon 37 (5): 118-125. 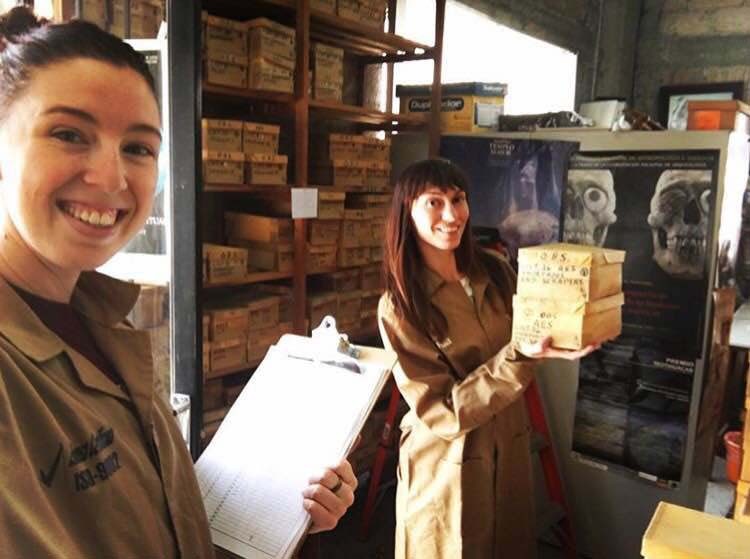 2016 Animal Management at the Ancient Metropolis of Teotihuacan, Mexico: Stable Isotopoe Analysis of Leporid (Cottontail and Jackrabbit) Bone Mineral. PLOS-One 11 (8): e0159982. 2015 Personal Art in Teotihuacan: The Thin Orange Graffiti. Ancient Mesoamerica 26 (2): 295-312. 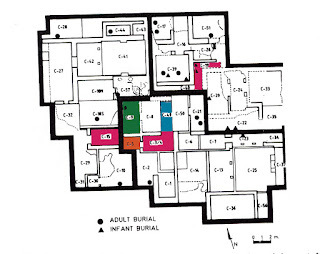 2006 Mortality Through Time in an Impoverished Residence of the Precolumbian City of Teotihuacan: A Paleodemographic View. In Urbanism in the Preindustrial World: Cross-Cultural Approaches, edited by Glenn R. Storey, pp. 277-294. University of Alabama Press, Tuscaloosa. 2017 Feeding Teotihuacan: Integrating Approaches to Studying Food and Foodways of the Ancient Metropolis. Archaeological and Anthropological Sciences 9 (1): 1-10. 2010 Teotihuacan City Layout as a Cosmogram: Preliminary Results of the 2007 Measurement Unit Study. In The Archaeology of Measurement: Comprehending Heaven, Earth and Time in Ancient Societies, edited by Iain Morley and Colin Renfrew, pp. 130-149. Cambridge University Press, New York. Sugiyama, Saguro, Nawa Sugiyama, and Alejandro Sarabia G.
2014 En interior de la Priámide del Sol en Teotihuacan. Arqueología Mexicana 125: 24-29. 2011 Teotihuacan and the Development of Writing in Early Classic Central Mexico. In Their Way of Writing: Scripts, Signs, and Pictographies in Pre-Columbian America edited by Elizabeth H. Boone and Gary Urton, pp. 77-109. Dumbarton Oaks, Washington, DC. 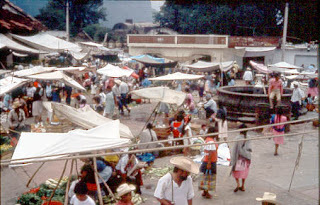 2010 The Teotihuacan Dream: An isotopic study of economic organization and immigration. In In "The “Compleat Archaeologist”: Papers in Honour of Michael Spence, edited by Christopher J. Ellis, Neal Ferris, Peter Timmins, and Christine C. White, pp. 279-297. Ontario Archaeological Society, London, ON. 2012 Estudios arqueométricos del centro de barrio de Teopancazco en Teotihuacan. Universidad Nacional Autónoma de México, Mexico City. 2009 Teotihuacan. Fondo de Cultura Económica, Mexico City. 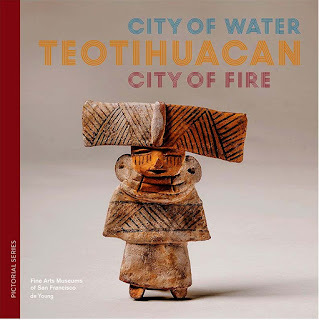 2017 Teotihuacan: City of Water, City of Fire. Fine Arts Museums of San Francisco, De Young, and University of California Press, San Francisco. 2001 The Terracotta Figurines from Sigvald Linné's Excavations at Teotihuacan, Mexico. Monograph Series, vol. 18. The National Museum of Ethnography, Stockholm. 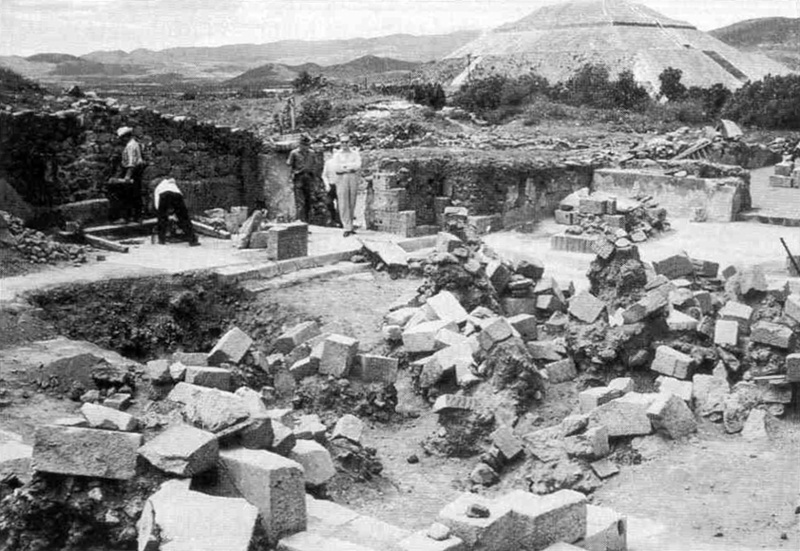 1975 Temples, Residences, and Artifacts at Classic Teotihuacan. Senior Honors Thesis, Department of Anthropology, Brandeis University. *** HA HA HA, HOW DID THIS OLD THING GET INTO THE LIST ??? 2017 Las Pinturas Realistas de Tetitla, Teotihuacan: Estudios a través de la obra de Agustín Villagra Caleti. Universidad Nacional Autónoma de México and Intituto Nacional Autónoma de México, Mexico City. 2005 Human Sacrifice, Militarism, and Rulership: The Symbolism of the Feathered Serpent Pyramid at Teotihuacan, Mexico. Cambridge University Press, New York. 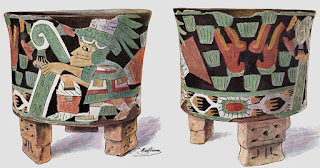 ADDED October 7, 2018: If you visit the exhibit, you may find my post about the art of Teotihuacan useful.